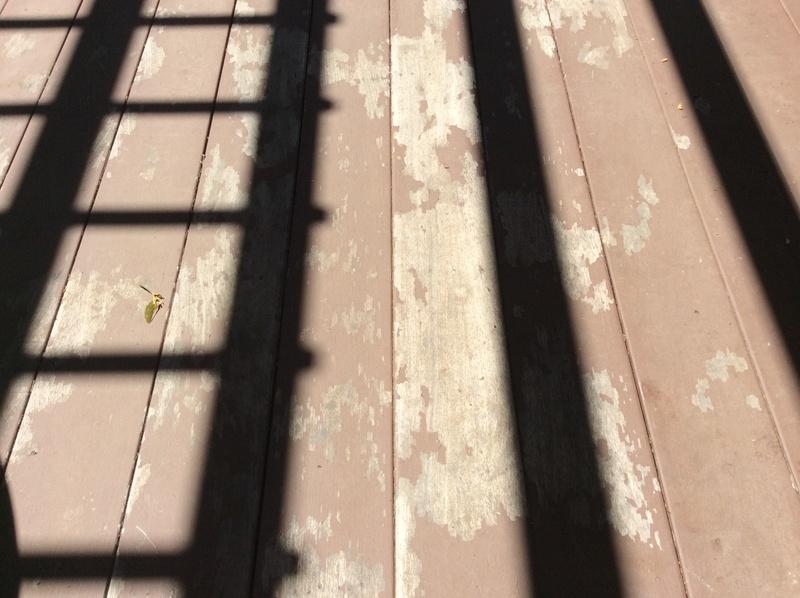 Our 8 year old IPE deck was not properly maintained and when we reached out to our painter last year, he said the original oil product was not appropriate due to the few years since it was done, harsh winters, sun, etc. He convinced us to let him use BM Arborcoat, Waterborne, Deck &Siding Solid. What a mistake! Now after a year, it is peeling off. What do you recommend ? Sanding then re-oiling? Picture was taken at high noon thus the shadows! Sorry to see and hear of this problem. This is a case where the old adage “water and oil don’t mix” comes into play. A waterborne stain stands very little chance of penetrating ipe. So it sits on top, relying on adhesion (ability to stick) to hold it on the surface. Over time, the natural oils in the grain of the ipe reject the waterborne from underneath, and the elements (sun, wind, rain) terrorize it from the topside, leading to the unsightly mess in your photo. Further, putting any kind of a solid stain on ipe is just bad advice and a good indication that the finisher may not be qualified for the job. Want to read more of this and other articles? Register or Login now!